ACH payments in US can be processed via Authorize.Net and Forte. 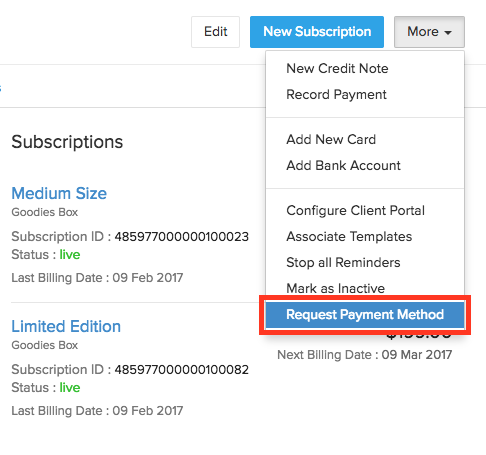 How ACH payments are processed in Zoho Subscriptions with Authorize.Net? How ACH payments are processed in Zoho Subscriptions with Forte? You can choose to process ACH payments via Authorize.Net or Forte or both. But before choosing the payment gateway, make sure to read the respective perquisites below. You must be a US merchant selling to US customers. Zoho Subscriptions may take anywhere from 5-15 days to process a transaction. As soon as an ACH Payment is initiated inside Zoho Subscriptions, Authorize.Net marks the transaction as settled. But, there are chances that it could be declined after a couple of days despite being marked as settled. To avoid this confusion, when an ACH payment is initiated, Zoho Subscriptions will wait 15 days before it mark the transaction as Success. From the day after initiation, Zoho Subscriptions will check daily with Authorize.Net for any changes in transaction status. If there are any changes, the Zoho Subscriptions will mark the transaction as Failure and will leave the invoice open. If there aren’t any failures even after 15 days, the transaction will be marked as Success and the invoice will be marked as Paid. During the 15-day waiting period, the respective invoice will be marked as Overdue or Sent based on the Payment Terms. You must either be a US merchant selling to US customers or a Canadian merchant selling to Canadian Customers. Zoho Subscriptions may take anywhere from 4-8 days to process a transaction. You must have configured Forte account for your organization in Zoho Subscriptions. Learn more. You must have Automated Clearing House account approved by Forte. Learn more. When an ACH Payment is initiated in Zoho Subscriptions, Forte waits 3-5 days before updating the status until they receive appropriate response from the ACH. Only then they will mark the transaction as settled or failure. From the day after initiation, Zoho Subscriptions will check in periodically with Forte to update the transaction status. Once you’ve configured the respective gateway, follow the steps below to configure ACH payment for a customer. 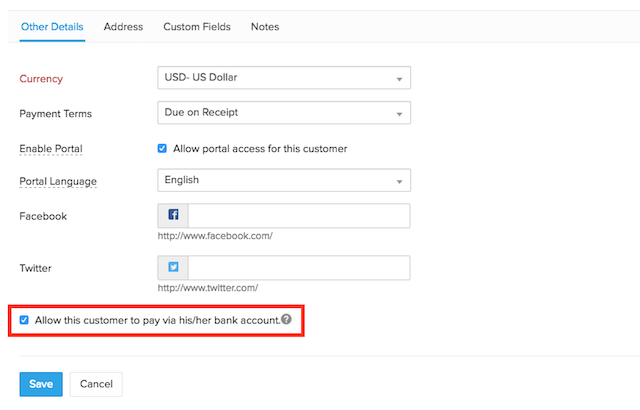 If your customer wants to pay via ACH, you have to enable the checkbox Allow customer to pay via his/her bank account in the customer Edit screen. The bank account added here will be charged on every subscription renewal. Bank account can be added in two ways - by the customer or by you. Once bank account is added, you can associate it to the customer’s subscription and make it online. You can use the Request Payment Method to get the card/bank account details from them. What this Request Payment Method essentially does is that it will send your customers a form to their email address requesting them to enter their card/bank account details. Once added, it will reflect under the respective customer inside Zoho Subscriptions. Select the More button at the top-right and click on Request Payment Method. Once done, Zoho Subscriptions will send an email to your customer’s email address with your organization details and they can add their bank account using the link provided in the email. There can come a situation where your customers would want you to add their bank account for them. Go to the Customers module and select the customer to whom you want to add the bank account. Select the More button at the top-right and click on Add Bank Account respectively. In the following screen, enter the bank account details and click on Save. Once bank account is successfully added, you have to manually associate the banks account to the subscription so that Zoho Subscriptions can automatically charge customer’s bank account on every renewal. 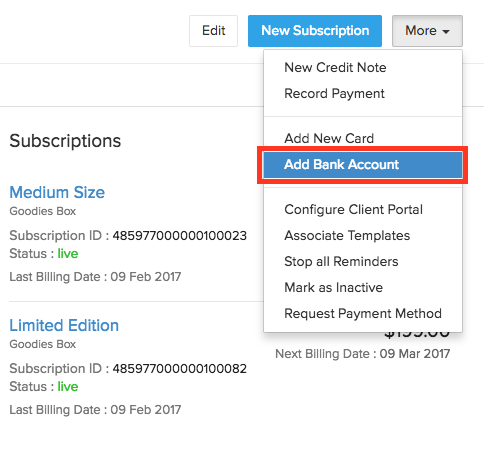 If Save is clicked instead, the bank account will be associated to the subscription but it will not been charged on renewals. It’ll still be an offline subscription. When your bank account is updated, all your ACH payments will be deposited to this updated bank account. Click on Account tab at the top-right and click on Billing Information from the left pane. In the following screen, click the edit button above the existing bank account details and update the new bank account. In Zoho Subscriptions, with respect to ACH payments, following email notifications will be sent to the customers. Learn more.